Unlicensed band means you do not have to pay for using the frequencies in this band. Wide bandwidth of 7 GHz allows high data rate transmissions. Remember Shannon Capacity Theorem? 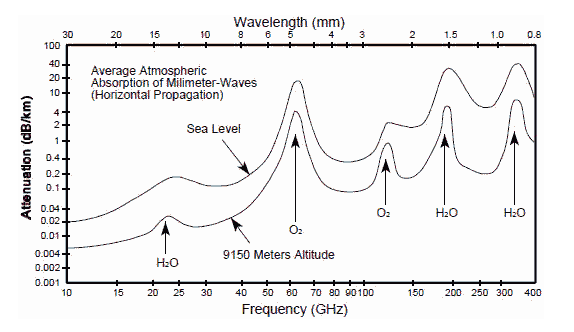 High atmospheric absorption resulting in greater path loss (up to 20 dB/km) and shorter range. This means lesser co-channel interference and higher reuse factor. Smaller antenna sizes allowing for multiple antennas to be put together in the form of an array providing high gain. This band is quite mature and electronic components are cheap and easily available. While most of the above points make sense, point (3) and (4) need a bit more clarification. At first higher path loss and shorter range seems to be a disadvantage. Moreover if we want a shorter range we do not need to increase the path loss we can just decrease the transmit power. After all Receive Power=Transmit Power-Path Loss. But to understand this fully we need to look at the receive power vs distance curve shown below. 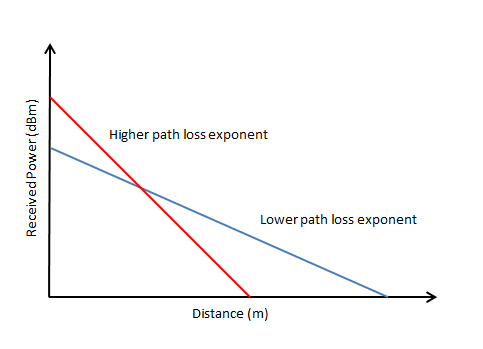 Higher path loss exponent (rate at which the received power falls off with distance) means that the slope of the line is higher. So at shorter distance the received power would be higher giving higher Signal to Noise Ratio (SNR) and greater Shannon Capacity or lower Bit Error Rate (BER). While at larger distances the received power would fall off sharply resulting in lower received power and lower co-channel interference, allowing for a higher frequency reuse factor. So with increasing frequency or decreasing wavelength (λ)the antenna aperture decreases. But what about gain (G)? Gain of an antenna is independent of frequency and remains constant. For example a half-wave dipole has a gain 1.64 (2.15dBi) irrespective of the frequency of operation. However the gain can be increased by using multiple antennas of relatively small gain each. If we use two antenna elements the gain increases by 3dB and similarly for four antenna elements the gain increases by 6dB. At 60GHz the wavelength is only 0.5cm, consequently the antenna size is also quite small, and a large antenna array comprising possibly hundreds of elements can be put together to achieve high gain and high aperture. Received power is usually proportional to 1/dn where d is the transmit-receive separation and n is the path loss exponent. The value of n is two in free space line of sight communication. But in dense urban environments it could be four or higher. The straight line behavior shown above is only observed when received power is in dBm and x-axis is on logarithmic scale. C=B log2(1+Ps/Pn). When the bandwidth increases there are two factors at play. First of all the capacity increases with increase in bandwidth but noise power (Pn=kTB) also increases due to which capacity decreases. The first factor is so overpowering that the combined response is almost a linear increase in C with an increase in B. Let us assume that the received signal power Ps is -70 dBm and bandwidth B is 7 GHz. This gives us a noise power Pn of -75.4 dBm and an SNR of 5.4 dB. The Shannon Capacity is thus calculated as 15.13 Gbps. This simple example just demonstrates the power of having a wideband channel like we have at 60 GHz. After revision, the 60 GHz band covers frequencies from 57 to 71 GHz (14 GHz of bandwidth). The frequency band is subdivided into 6 different channels in IEEE 802.11ad with each channel occupying 2160 MHz of BW.